One of the Atlantic region’s most iconic species, the striped bass is an important recreational and commercial species. Striped bass are also grown in aquaculture operations. Striped bass are very hardy fish, and even take to life in freshwater. They are frequently stocked in reservoirs and other impoundments. Striped bass are commonly hybridized with white bass, which results in fast-growing, hardy offspring. 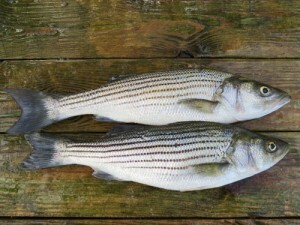 Striped bass are also known as rockfish, striper, linesides, and other names.